Thais speaks to groups big and small about The Intersection Between Childbirth and Social Justice, How to See Invisible Choices, and How to Be The Hero of Our Lives! She lives in beautiful Marin County, CA with her husband and two boys, where she is writing her second book. 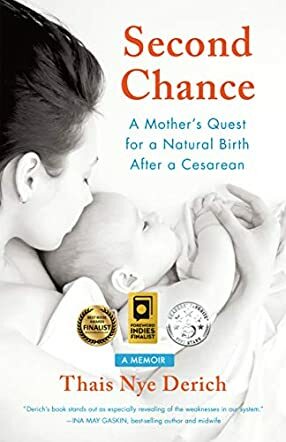 Second Chance: A Mother’s Quest for a Natural Birth after a Cesarean by Thais Nye Derich is the beautiful journey of the author whose first birth experience in hospital culminated in an unplanned cesarean. The author shares her difficulties of healing and recovery after a cesarean and how she opted for a vaginal birth after a cesarean (VBAC). Her book reaches out to all expectant mothers and empowers them during the birth of their children, enabling them to grow in their spirituality, confidence, and power through birth. Not many women experience a cesarean and VBAC, and this memoir is an honest look at the birth process and the choice in birth style. The book is candid and the author shares intimate details about her pain, trauma, suffering, and healing, and finally deciding to opt for a VBAC for her second child. The author’s physical and emotional trauma sheds light on the healthcare system when it comes to giving birth and her frustration is palpable while reading the book. The memoir is an encouragement to all mothers who want to go for natural birth and it also proves that vaginal birth is possible after a cesarean, though many hospitals in the USA have banned vaginal birth after a cesarean. The author’s story is heartrending and poignant, and will make everyone look at the options of what should be done to make childbirth safer and healthier for women. It captures the process, excitement, vulnerability, tension, expectation, and finally the raw surrender of giving birth.